Backstage at this show was a beach. How cool is that? Singer-songwriter-guitarist Aubree McCurdy of Hilliard relaxes at the beach before taking the stage, while her dad, Shaun, tunes her guitar. Dale Morgan, of Ada, sings to the judges during the Beach Spectacular. 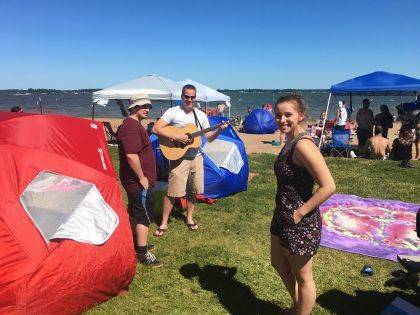 A crowd of approximately 5,000 people covered the beach when the Indian Lake’s Got Talent Show took center stage. Many came for the Beach Spectacular fireworks and festivities, but it was a good turnout for the show also, which was held at Old Field Beach on July 7. “I was really surprised with the large turnout, “ said singer, songwriter and guitarist Aubree McCurdy from Hillard. McCurdy dazzled the crowd last week in the preliminary talent auditions with an original song she wrote and played, earning her a spot in the finals. The talent pool was strong this year with a lot of heart and soul poured onto the stage. Seventeen vocalist and one singer/songwriter guitarist (McCurdy) competed in the finals. In the end, singer Dale Morgan from Ada stole the show with an entertaining “spot on” rendition of the song “Save a Horse, Ride a Cowboy.” He worked the crowd like a pro and totally engaged the audience having them sing along and practically had them eating out of his hands, so to speak. He even used a wooden rocking horse as a clever prop which bought down the house, earning him first place, a plaque and a cash prize. 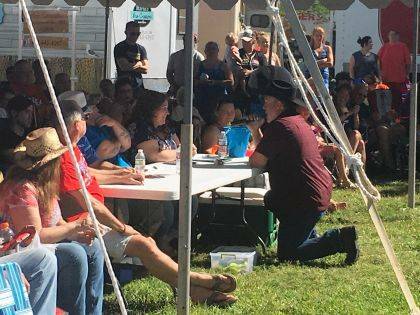 “You’ve gotta use the ‘wow factor’ to really have a chance in these contests,” said Morgan, who just the day before was a finalist at the talent contest at the Country Concert in Lake Loramie. In fact, Morgan has placed 1st, 2nd, 3rd and 4th in previous Indian Lakes Got Talent competitions in the past. Morgan, who is 53, is also the director of the drama club for the Upper Scioto Valley School District In McGuffey, Ohio. Second place, in the adult division went to Nick Clevenger, age 26, from Venedocia, Ohio (population 124 people). Clevenger, singing a country tune in his all black duds and black cowboy hat, won a plaque and a cash prize also. Clevenger competed in the Nashville Voice a few seasons ago. “It’s more about the fun than the winning,” said Clevenger. “This was really a great time,” adds Clevenger, who will also compete in the Columbus “Voice” competition in September. In the unofficial categories of perseverance, fortitude and overcoming adversity those awards must to go to Aubree McCurdy from Hillard, Ohio. McCurdy, the only contestant to play both a musical instrument and sing in the competition, overcame many technical problems with the amplifier, guitar cord and both microphones. This is a live event and anything can happen, good or bad. Her father Shaun had to hold two microphones for both voice and guitar on stage for his daughter while she managed to belt out a magnificent version of Little Big Town’s song “Pontoon.” It was actually a very touching moment. “For a while there, on stage, I couldn’t even hear myself playing my guitar with all the feedback coming from the mics and wind, but I pushed through it,” said McCurdy. McCurdy will be competing in “American Idol” in Columbus, Ohio in September. In the youth division the duet of Ainsley Manger (age 13) and Paige Doseck (age 15), both from Botkins, Ohio took first place. Emma Ferguson from Ada, Ohio was runner-up.